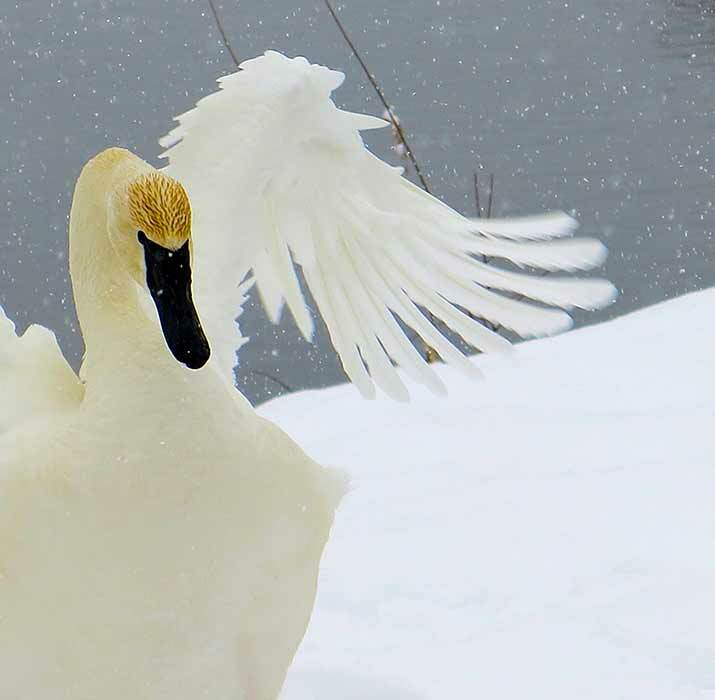 The trumpeter swan is a species of swan found in North America. The heaviest living bird native to North America, it is also the largest extant species of waterfowl with a wingspan that may exceed 10 ft. I was in my back yard, on the stream, one snowy morning and saw my “friends”, “Swanee and River”, the names I gave them, coming on to the bank. I tried to speak with them for awhile, but they didn’t even notice me. Then I began to sing…”Jingle Bells” of all things….all of a sudden, they looked up at me, began to “sing” with me, bobbing my head up and down and honking, flapping their wings….what a sight, what a moment. Although it was snowing, the light was rather good. The following were my camera settings: ISO 80, f2.8 1/2000, a 30.5mm lens using a Canon PowerShot G15 camera. I hadn’t expected to be shooting that morning so I didn’t have my larger camera’s with me, just grabbed the Canon PowerShot G15 off the kitchen counter. Again, my own words come back to bite me, ALWAYS HAVE YOUR CAMERA NEAR BY!